Most disabled people in the world live in villages and poor communities where they never see a 'rehabilitation expert' or 'physical therapist'. But this does not always mean that they have no 'rehabilitation' or 'therapy'. In many villages and homes, family members, local craftspersons, traditional healers, and disabled people themselves have figured out ways for persons with disabilities to do things better and move about more easily. We have seen examples where local carpenters, tinsmiths, leatherworkers or blacksmiths have put together simple crutches, carts, wooden legs and other aids. We know parents who have figured out ways of adapting daily activities so that their children can help do farm work or housework-and at the same time get much of the exercise (therapy) they need. Two words often used by people who work with disabled persons are 'rehabilitation' and 'therapy'. Rehabilitation means returning of ability, or helping a disabled person to manage better at home and in the community. Therapy basically means treatment. Physical therapy-or physiotherapy-is the art of improving position, movement, strength, balance, and control of the body. Occupational therapy is the art of helping a disabled person learn to do useful or enjoyable activities. We speak of 'therapy' as an art rather than a science because there are many different beliefs and approaches, and because the human feeling that goes into therapy is as important as the methods. In India, I met a villager who had lost a leg in a house-building accident. 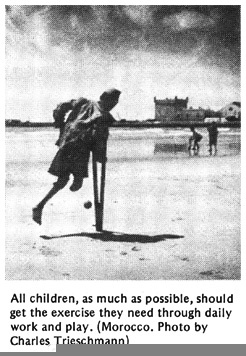 Using his imagination, he had made himself an artificial leg with a flexible foot out of strong wire with strips of an old cotton blanket for padding. After several months, he had the chance to go to a city where a professional 'leg maker' (prosthetist) made him a costly modern fiberglass leg. The man tried using the new limb for a couple of months, but it was heavy and hot. It did not let his stump breathe like his 'wire cage' leg. And he could not squat to eat or do his toilet, as he could with his homemade leg. Finally, he stopped using the costly new leg and went back to the one he had made. For the climate and customs where he lived, it was more appropriate. In a small village in Mexico, over the years, the community together with its deaf citizens has developed a simple but expressive 'sign language' using their hands, faces, mouths, and whole bodies to communicate. As a result, children who are born deaf quickly and gracefully learn to express themselves. They are well accepted in the community, and some have grown up to become creative and respected craftspersons. This village method of 'total communication' allows the deaf children to learn a useful language more quickly, easily, and effectively than does the 'lip reading and speech' method now taught in the cities. For children who are born deaf, attempts to teach only lip-reading-and-spoken- language often end in cruel disappointment (see Page 264). The 'special educators' in the cities could learn a lot from these villagers. Disabled children-if allowed-often show great imagination and energy in figuring out ways to move about, communicate, or get what they need. Much of what they do is, in effect, 'therapy', artfully adapted for and by each child. With a little help, encouragement, and freedom, the disabled child can often become her own best therapist. One thing is certain: she will make sure her therapy is 'functional' (useful), always changing it to meet her immediate needs. A disabled child, like other children, instinctively knows that life is to be lived NOW and that her body and her world are there to be explored, used, and challenged. The best therapy is built into everyday activities: play, work, relationship, rest, and adventure. The challenge, then, for health workers and parents (as well as for therapists), is to look for ways that children can get the 'therapy' they need in ways that are easy, interesting, and functional. This takes imagination and flexibility on the part of all those working with disabled children. But mostly, it takes understanding. When family members clearly understand the reasons for a particular therapy and the basic principles involved, they can find many imaginative ways to do and adapt that therapy. Appropriate therapy helps the child to enjoy himself, be useful, and take part with others, while mastering the skills for daily living. Physical therapy and rehabilitation techniques have been developed mostly in cities. Yet most of the world's disabled children live in villages and farms. Their parents are usually very busy growing the food and doing the chores to keep the family fed and alive from day to day. In some ways, this makes home therapy more difficult. But in other ways it provides a wide range of possibilities for exciting therapy in which the child and his family can meet life's needs together. Here is a story that tells how therapy can be adapted to village life. Maricela lives in a small village on a river. She has cerebral palsy. When she was 4 years old, she was just beginning to walk. But her knees bumped together when she tried to take steps. So she did not try often. Also, her arms and hands were weak and did not work very well. Her family saved money and took Maricela to a rehabilitation center in the city. After a long wait, a therapist examined her. He explained that Maricela needed to stretch the muscles on the inner side of her thighs, so her knees would not press together as much. He recommended that her parents do special exercises with her, and that they buy a special plastic seat to hold her knees wide apart. He said she also needed exercises to strengthen and increase the control of her hands and arms. He suggested buying her some special toys, game boards, and aids to practice handling and gripping things. Maricela's family could not afford these costly things. So back in her village her father used whatever he could find to make similar aids at low cost. First he made a special seat of sticks. Later he made a better seat with pieces of wood, and an old bucket to hold her legs apart. Then, using a board, corn cobs and rings cut from bamboo, he added a small table so that she could play games to develop hand control. He also made a hand exerciser out of bamboo. 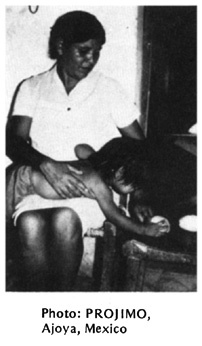 At first, while they were strange and new, Maricela used her special seat and played with her special toys. But soon, she got bored and stopped using them. She wanted to do the things that other children did. She wanted to go with her father and brother to the cornfield. She wanted to help her mother prepare food and wash the clothes. She wanted to be helpful and grown up. So she broke her special toys and refused to sit in her special seat. Her parents were furious with her-and she loved it! She would sit for hours with her knees together and her legs bent back. Walking began to get more difficult for her, so she did not walk much. When she was good (and sometimes even if she was not) her father would let her help shell corn with him and the other children. Because she had trouble holding the corn and snapping off the grain with her fingers, her father made a special holder and scraper. The basket between her legs held her knees apart, and the shelling of the corn strengthened her arms, gave her practice gripping, and improved her coordination and control. It was hard, important work that Maricela found she could do. And she loved it! Maricela's mother sometimes invited her to help wash the clothes at the river. Maricela would sit at the river's edge with a big ' washing rock' between her legs. She would wash the clothes by squeezing and beating them against the rock- just like her mother. The rock kept her knees apart and the squeezing and banging strengthened her hands and improved her control. But what mattered was getting the clothes clean. it was hard work. But she found it easy-and fun! Coming back from the river, Maricela just had to walk. It was too far to crawl. And besides, she had to help her mother carry back the washed clothes. This was hard, but she tried hard, and could do it! Carrying the pails of clothes helped her learn to walk without bending and jerking her arms so much. To help Maricela grip the handle of the pail easier, her father wrapped a long strip of old bicycle inner tube very tightly around the handle. But when Maricela's hand sweated, the smooth rubber got slippery. So her father wound a thin rope around the rubber. This way, Maricela could hold it better. As time passed she learned how to carry a bucket of clothes on her head-then a bucket of water. To do this took a lot of practice with balance and control of movement. She just had to keep her legs farther apart to keep her balance. Her mother was almost afraid to let her try carrying the water. But Maricela was stubborn- and she did it! Maricela also discovered that if she floated a gourd dipper (or a big leaf) on top of the water, it helped keep the water from splashing out. So, by trying different things, Maricela's family, and Maricela herself, learned ways to create therapy and aids that were effective, useful, and enjoyable. Maricela did learn to walk better, and to use her hands and arms to do many things. But this took a long time. Sometimes she would try something that was too hard, and almost give up. But when her little brother would say she could not do it, she would keep trying until she succeeded. 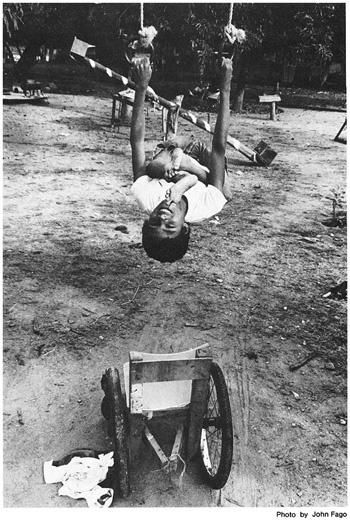 Even when Maricela liked doing something, because she was a child she would get bored and not keep doing it for long. Her parents always had to look for new ways for her to get her therapy. It became a challenge and a game for them, too. Of course, Maricela loved horses. So her father made her a rocking horse out of old logs, branches of trees, and a piece of rope for a tail. Her father noticed that she was beginning to walk on tiptoe, so he made special stirrups for the rocking horse. With these, when she rocked, her feet stretched up in a more normal position. The rocking horse kept her knees apart, strengthened her hands, and helped her improve her balance. Maricela loved her horse and sometimes rocked for an hour or more. When she got off, it seemed she could walk better. After Maricela had learned to ride the rocking horse, she wanted to ride the real thing. She begged and begged. So one day her father let her ride with him to the cornfield on his donkey. He suggested she ride in front of him where he could hold her. But she insisted on riding behind, like other children do. So he fixed some stirrups and let her ride behind. Her legs were spread wide and she hung on tightly. It was excellent therapy - but nobody called it that. In the cornfield she helped her father and brother clean the weeds out from among the young corn plants. That was good for the young plants-and for her, too! But after several trips to the cornfield on the donkey with her father, Maricela begged him to let her ride alone. He was nervous, but he let her try. She could do it-and what confidence it gave her! Soon Maricela was preparing lunch for her father and brother and taking it to them in the cornfield-all by herself. Now she found she could do many other things she never thought she could. Although she was still awkward, and at times had to look for special ways to do things, she found she could do most anything she wanted or needed to. The example of Maricela's 'therapy' cannot and should not be copied-but instead, learned from. In fact, the story suggests that no approach to rehabilitation should be copied exactly. Our challenge is to understand each child's needs, and then to look for ways to adapt her rehabilitation to both the limitations and possibilities within her family and community. We must always look for ways to make therapy functional and fun. Recently, some 'appropriate technology' groups have tried to adapt standard 'rehabilitation aids' to poor rural communities. However, many of their designs are modeled fairly closely after the same old city originals, using bamboo and string instead of plastic and aluminum. Some of these low-cost designs are excellent. But more effort is needed to make use of the unique possibilities for rehabilitation and therapy that exist in the village, farm, or fishing camp. Maricela's family did just this. 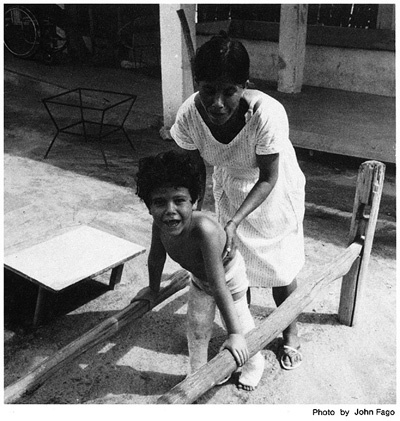 The basket of corn, the washing rock, the rocking horse, and the donkey all became 'therapy aids' to help Maricela spread her spastic legs, and at the same time, to take part in the life of her family and community. We should encourage each family to observe the specific needs and possibilities of their disabled child, to understand the basic principles of the therapy needed, and then to look for ways to adapt the therapy to the child's and family's daily life.